The plaintiff in the case was Fred Korematsu who was 23 years old at the time of the Japanese attack on Pearl Harbor. Fred was a Nisei – second generation Japanese American. He was born in Oakland, third of four brothers. His parents owned a flower nursery. Fred was a welder in a shipyard in May 1942 when he refused to report to an assembly center per Executive Order 9066. Fred was convicted in the U.S. District Court for the Northern District of California of “remaining in the prohibited area after the evacuation deadline.” Fred’s appeal ultimately reached the Supreme Court. 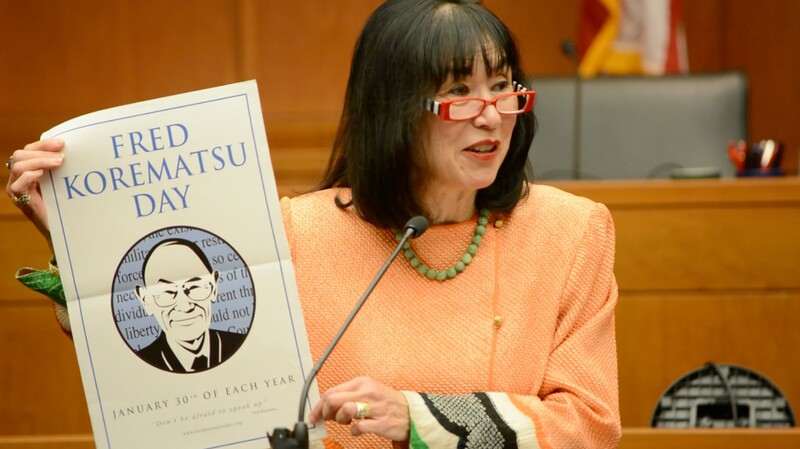 According to Fred’s daughter Karen Korematsu – the executive director of the Fred Korematsu Foundation – Fred pursued his case because he was an American citizen and believed his incarceration was wrong. Forty years later, the same federal district court vacated Fred’s conviction via a petition of writ coral nobis. Researchers Peter Irons and Aiko Herzig-Yoshinaga discovered information compiled by the FBI, the Office of Naval Intelligence, and the Federal Communications Commission contradicting reports of Japanese-American disloyalty and espionage upon which the government relied for the basis of the military order and the legal justification for the executive order. The United States government suppressed and concealed evidence from the justices of the United States Supreme Court. 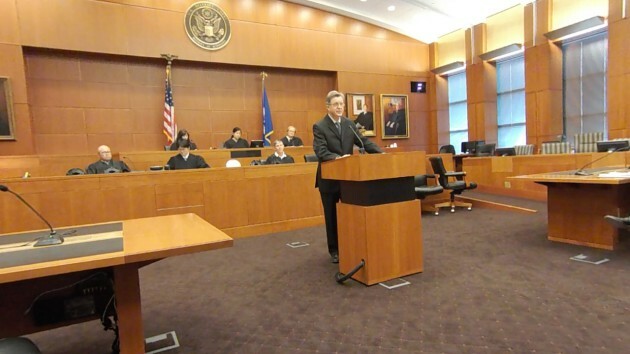 Sponsored by the National Asian Pacific American Bar Association and the Minnesota Asian Pacific American Bar Association, the play was performed in the Federal Courthouse of Minneapolis in the chambers of Chief Judge John Tunheim. 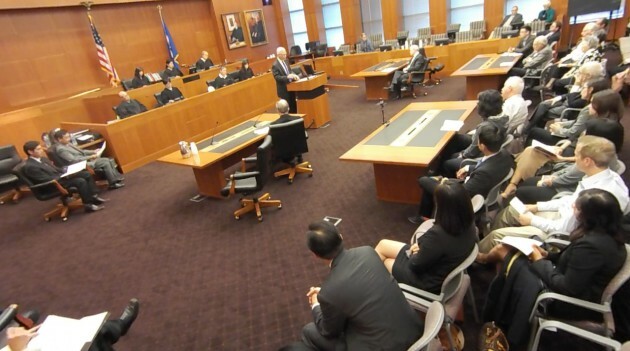 The cast included Federal Judges Franklin Noel, Jeffrey Keyes, Tony Leung, Donovan Frank; Minnesota Supreme Court Justice David Lillehaug; Peter Reyes, Minnesota Court of Appeals; Minnesota district court judges Regina Chu; Nicole Starr and Susan Burke. Other cast members included Christina Ogata, General Counsel for Education Minnesota; Daniel Le; Cynthia Lee; and myself. Providing support for the re-enactment were Thomson Reuters (who made the printed program possible with thanks to Marisa Marek); the Japanese American Citizens League of the Twin Cities; the Minnesota Historical Society (with thanks to Executive Director Stephen Elliott); and the Jewish Community Relations Council of Minnesota and the Dakotas. 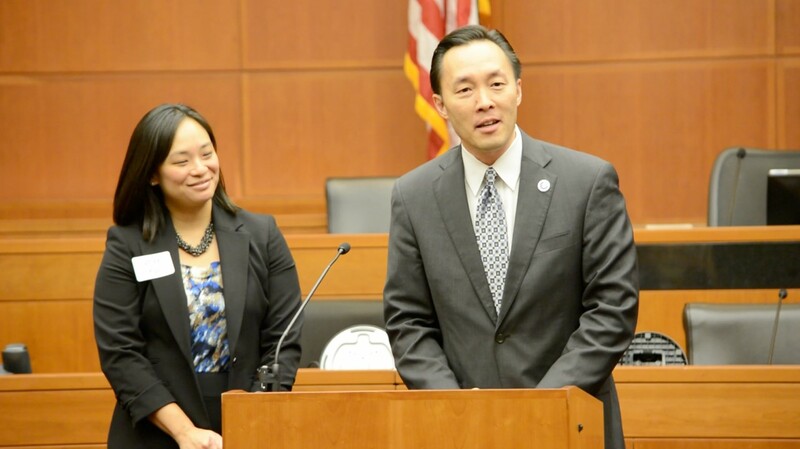 Irene Kao, Esq. and Greg Schwartz, Esq. provided tremendous leadership. Justice Stone wrote his famous “Footnote Four” in United States vs. Carolene Products, 304 U.S. 144 (1938). Justice Stone asserted that legislation aimed at “discrete and insular minorities” which lacked the normal protection of political processes would be an exception to the presumption of constitutionality justifying a higher standard of judicial review. The Executive Order and subsequent mass incarceration of Japanese Americans precisely fits the definition of a sequence of events where judicial intervention was necessary to address the suspension of civil rights against people practically powerless to protect themselves. Japanese Americans were indeed “discrete and insular” having been subjected to previous anti-Asian legislation since the turn of the 20th century. They were recognized by appearance – Fred Korematsu underwent surgery to change his appearance – and sometimes by language, custom and culture. A large percentage of Japanese Americans lived on the west coast and Hawaii. As for the protection of political processes, the fear that swept the United States after the Pearl Harbor attack which included rumination of Japanese invasion of the United States left Japanese Americans largely branded as potential fifth columnists. Political protection for Japanese Americans was non-existent. Nevertheless, the Supreme Court did not extend the protection of “Footnote Four” under the Fifth and Fourteenth Amendments of the Constitution in part because the majority believed the government had proven the necessity of issuance of the Executive Order and the mass incarceration carried out under its aegis. Decades later the research efforts of Peter Irons and Aiko Herzig-Yoshinaga and the legal advocacy of Dale Minami thoroughly discredited and exposed the fabrication of the conclusions drawn in the report of General John DeWitt, the United States West Coast military commander. Absent protection from the executive and judicial branches for the discrimination faced, Japanese-Americans essentially took their case to the American people with their bravery and service to their country in both the European and Pacific theatre of operations. (This is similar to the wartime record of African Americans and Native Americans who faced systemic societal and political discrimination in the United States yet served their country with great distinction in the national fight against Nazism, Fascism and Japanese militarism.) Below is the story of Edwin Nakasone who was inducted into the United States Army near the end of the war and served as a linguist in the occupation of Japan. Mr. Nakasone – from White Bear Lake – is also one of the leading historians of the exemplary Japanese American service in World War II in the United States military. Remarkably, the immense impulse of Japanese Americans to serve their country in World War II eclipsed even the profound humiliation and degradation of government mandated discrimination and internment visited upon them in the aftermath of the Pearl Harbor attack--particularly on the West Coast. Many of the threads of this story are contained in the life of Edwin Nakasone of White Bear Lake. Spared the worst of the impact of the Roosevelt Administration's executive orders because of the differing circumstances in Hawaii, Edwin journeyed via his military service from Oahu to Minnesota and ultimately to occupied Japan. Fondly recalling his time at Fort Snelling, Edwin returned to Minnesota for his college education. He made a career in suburban St. Paul as an educator and raised his family. Trim and fit at 88 years old, he continues to tell the story of the great patriotism of Japanese Americans in World War II--under the most trying of circumstances. Edwin was born April 29, 1927--the year of the Lindbergh flight, the great Mississippi River flood and the execution of Sacco and Vanzetti. He was the fifth child of a family of ten children of Japanese immigrant parents. His father came to territorial Hawaii shortly before the outbreak of World War I, circa 1913. Edwin's neighborhood was comprised primarily of Japanese, Chinese, Korean and Hawaiian families. He would go door to door selling strawberries in the Caucasian neighborhood of Marigold Acres. Edwin had a happy childhood in the Hawaiian sunshine playing baseball, softball and football with occasional trips to Honolulu--15 miles away. On the morning of December 7, 1941, Edwin was eating a breakfast of Kellogg's corn flakes and Carnation sweet cream from a can--the Nakasone home did not have a refrigerator. From his home--looking through a pass in a mountain range--Edwin could see Schofield Barracks which was adjacent to Wheeler Army Airfield. At this distance he could see specks of planes diving which he soon realized were Japanese planes strafing the barracks. Next, Edwin heard explosions as Japanese dive bombers attacked the planes at Wheeler. A short time later he said to himself "Oh my God" as a Japanese plane flew low enough overhead so he could see the pilot with an open cockpit and his cloth scarf flowing in the wind--the red ball of Japan affixed to his plane's wings and fuselage. Edwin read the newspapers each day and was aware of the military and diplomatic tension between Japan and the United States which preceded the Pearl Harbor attack. Edwin--like nearly all Nisei (children of Japanese immigrants)--saw himself as "all-American" eager to participate in the war effort against Japan. Every Tuesday--for the war effort--Edwin worked in the pineapple fields. Martial law was imposed in Hawaii after Pearl Harbor--all people were subject to these conditions. The Nisei could work as civilians for the Army but not for the Navy or Coast Guard. Edwin's identification button and photograph bore a border designated "restricted." This designation was not attached to the identification of Caucasians. Nevertheless, unlike the internment of more than 110,000 Japanese Americans on the mainland, Edwin and his family considered themselves "well-treated" during the war years. Relationships with their Filipino, Korean and Chinese neighbors remained friendly. Edwin proudly registered for the Selective Service in April, 1945 and "serving Uncle Sam." He was drafted in August, 1945 and inducted at Schofield Barracks--the target of the attacks he could see from Wahiawa on December 7, 1941--shortly after the atomic bombings of Hiroshima and Nagasaki. After training assignments in San Francisco and Alabama, Edwin arrived for MIS training at Fort Snelling on Christmas Day, 1945. The temperature was -5. The Pacific War had ended three months earlier. The mission of the MIS was--among other things--to train linguists for the American occupation forces of Japan. Edwin did well in his MIS training and arrived in Japan in early February, 1947. The MIS graduates were critically important in providing intelligence and assessment of the Japanese from practically the beginning of the entry of the United States into the Pacific War. From the Battle of Midway to the invasions of Guadalcanal, Tarawa, the Marshall Islands, New Guinea, Iwo Jima and Okinawa the "6,000 Niseis shortened the Pacific War by two years" according to Major General Charles Willoughby, G2 Intelligence Chief for General Douglas MacArthur. Eventually, during the course of the war, the MIS outgrew Camp Savage and was relocated to Fort Snelling before its return to the West Coast at the Presidio in Monterey, CA in July, 1946. As a graduate of the MIS with this legacy, Edwin was stationed in Japan until April of 1948, primarily in Tokyo. The city was devastated. All buildings were "blown away." There was nothing standing to obscure the view of Mt. Fuji 100 kilometers away. In Yokohama, there was little left but a hulk of Japanese shipping and industry. Interestingly, the amalgamation of his Japanese and American heritage in the service of the United States made Edwin a natural interlocutor with the Japanese population under occupation. Edwin recalls befriending a physician's family and attending their daughter's wedding. There was the cross cultural experience of sharing C Rations with the family and eating a meal of Vienna sausage and pork and beans with Japanese rice. As part of the 168th Language Detachment Unit, Edwin accompanied his units as they performed their occupation duties. He became the NCO in charge and assigned the Nisei soldiers their daily duties. Edwin heard from the populace the lengths the Japanese military had been prepared to go in defending Japan from an American invasion. Japanese civilians were being trained to attack the beaches and landing American soldiers with bamboo lances. Japanese civilians frequently blamed "militarists" for Japan's aggression in World War II. Edwin returned to Hawaii in April, 1948. Edwin enrolled at the University of Hawaii in the summer of 1948 and in two years received his ROTC commission having been accepted into the program. Meanwhile, Edwin recalled his own experiences at MIS at Fort Snelling and he knew a Japanese American family who had relocated to Minneapolis from Arizona’s internment camp. He was motivated to return to Minnesota. Edwin transferred to the University of Minnesota in September, 1950 and received a degree in history and political science under the GI Bill. He later received a Master’s in political science and history from the University of Minnesota. Edwin has had a long and distinguished career in education in Minnesota. He taught at White Bear Lake High School for 14 years and Century College for 33 years. Edwin "retired" in 2000 only to be called to the service of his country as a professor aboard United States Navy ships teaching college level courses enabling sailors to earn college degrees in the NCPACE program. In this capacity, he has participated in nine such educational "sailings" and went around the world twice. Edwin has been married for sixty-one years. They raised two sons, the youngest now a major general in the United States Army. Edwin and Mary have seven grandchildren and two great granddaughters. Edwin has also dedicated himself to telling the story of the extraordinary heroism and the extraordinary contradictions faced by Nisei soldiers in their service to the United States--by book and by lecture. Edwin's book – “The Nisei Soldier" (Rapit Printing, White Bear Lake, MN; 4th edition, 2012) chronicles such stories as the "Go for Broke: the Nisei 442nd Regimental Combat Team" and a Japanese diplomat's courage in the face of the Holocaust: "Chiune (Sempo) Sugihara: Japan's Oskar Schindler." World War II and the Korean War was "not only as the brave soldiers they turned out to be, but as loyal citizens who were often distrusted, discriminated against and actually incarcerated and otherwise deprived of their civil rights." Briefly, the record of the Nisei fighting spirit in World War II was exemplified by the 442nd Regimental Combat team. Comprised primarily of soldiers from Japanese American families interned on the mainland or from Hawaii, the 442nd saw extensive combat in Italy, southern France and Germany. The original 4,000 person regiment was replaced 2.5 times. The 14,000 members of the regiment were awarded: 9,485 Purple Hearts; eight presidential unit citations; and 21 Congressional Medals of Honor, including one to the late Sen. Daniel K. Inouye from Hawaii. Another Nisei unit – the 522nd Field Artillery Unit which was part of the 442 Regimental Combat Team – was the first to liberate over 30 sub concentration camps around Dachau (Augsburg, Bad Tölz, Munich, Salzburg and Waakirchen). The Nisei--whose families on the West Coast were subject to appalling governmental and institutional racism depriving them of due process and their civil rights – fought ferociously and consequentially, by mind and body, the ultimate evil of the Axis powers.